Modern couch surfer. The new Acer Iconia Tab A200 brings the latest technology to the private living room. In addition to a 10.1 inch screen, it features a 16 GB memory capacity, wifi module and Google's Android 4.0.3 ICS. The lack of a UMTS module won't be a decisive factor in view of a price of EUR 349, as our test report shows. Acer proves that it doesn't always have to be a fully equipped tablet for over EUR 500 with its new Iconia Tab A200. It includes all important functions on Nvidia's Tegra 2 ARM platform (dual core CPU, 2x 1 GHz) for EUR 349 (RRP). The connectivity is taken care of by an integrated wifi and Bluetooth module, and it's even possible to use the tablet as an oversized navigation system via GPS. The 10.1 inch screen has the standard resolution of 1280 x 800 pixels in a 16:10 aspect ratio. In terms of memory, the entry-level tablet has a built-in 16 GB flash memory that can be increased by a further 32 GB via a micro SD card reader. The probably most important update, besides the throughout familiar components and features, is the new Google Android 4.0 operating system aka Ice Cream Sandwich (ICS). For example, the user interface has been modified and the links to other Google services has been reinforced, in addition to the other innumerable improvements. Acer hasn't made any modifications to design or functionality, apart from a small widget (Acer Ring - quick start) and the pre-installed software. That sounds like a solid total package? We checked the qualities of the little portable companion. 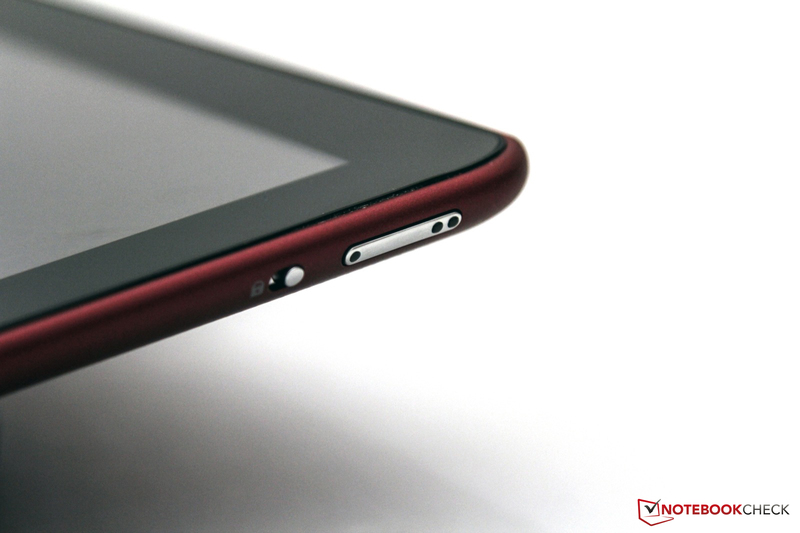 The technology of the Iconia Tab A200 is embedded in a plastic case with a rubber coated rear. 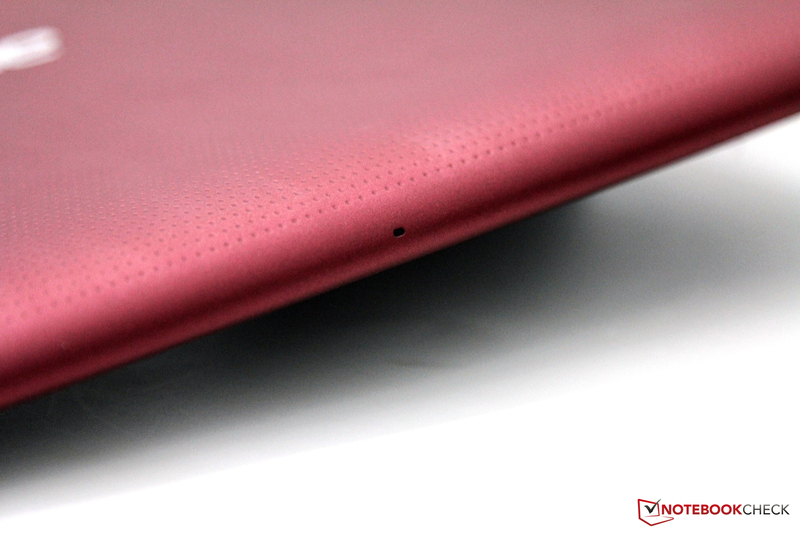 The tablet's feel convinces with its dotted texture and rounded edges. Nevertheless, the overall impression of its appearance isn't anything special. 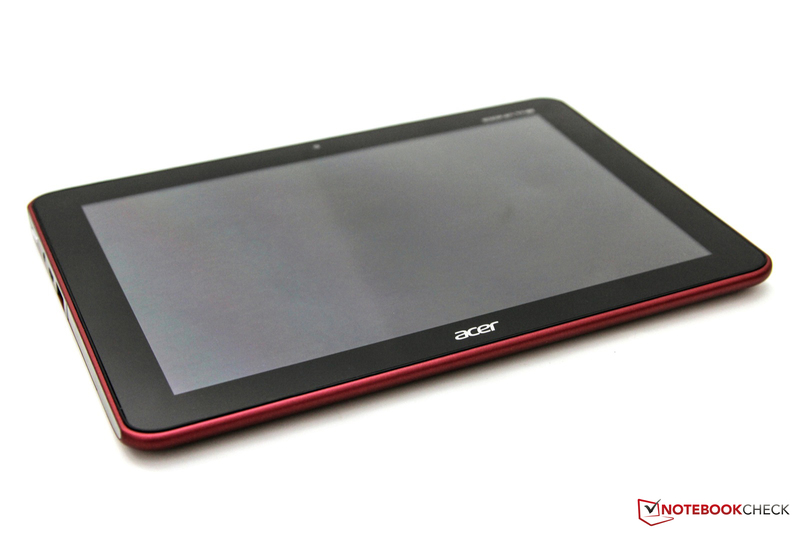 The A200's design equals that of Acer's other A series devices, including the Iconia Tab A500 and the smaller Iconia Tab A100. The workmanship makes a high-end impression. We didn't note any irregular gaps or manufacturing errors. Depending on preferences, the A200 is available in a rather boring combination of gray and black, called metallic gray, or in a more striking metallic red. The latter found its way to our editorial office and we find this color design appealing because it's not too obtrusive. The case's stability makes a good impression. It can only be twisted marginally, whereas no unusual noises are emitted under these forces. 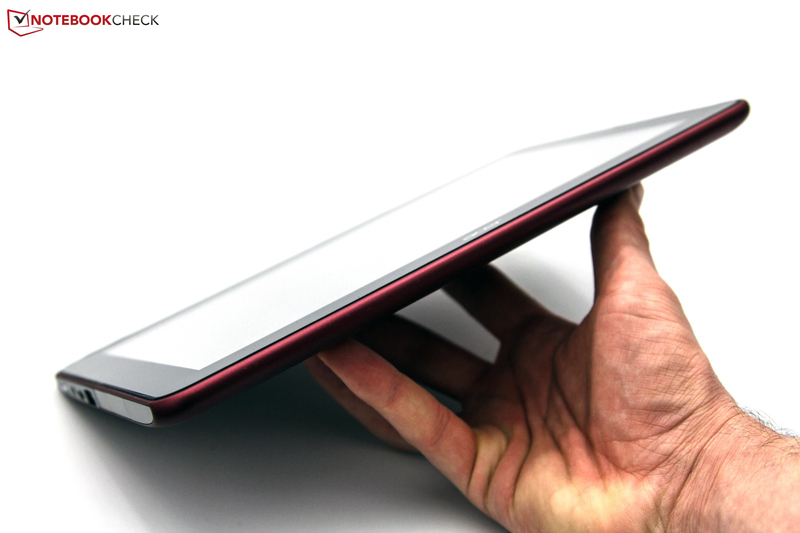 A quick weigh-in shows that the Iconia Tab weighs 710 grams and is heavier than comparable tablets. For example, the new Apple iPad weighs 662 grams (difference: 7.25 percent), the Asus Eee Pad Transformer Prime TF201 merely weighs 589 grams (difference: 20.5 percent) and the recently reviewed Motorola Xoom 2 weighs 602 grams (difference: 17.9 percent). The difference is especially noticed subjectively after longer use. The lighter alternatives have a clear advantage here. It is also comparatively thick with a build height of 12.7 millimeters. The above mentioned comparison devices are slimmer on average (9.4 / 8.3 / 8.8 millimeters). The tablet's interface diversity is limited and is mainly confined to the device's left side. The exception is the power socket that is found separated on the right. The opposite side contrasts this with a micro USB and a standard USB 2.0 port, a micro SD card reader (microSDHC, up to 32 GB) and an audio in jack. A simple headphone or a corresponding headset can be connected to the latter port. 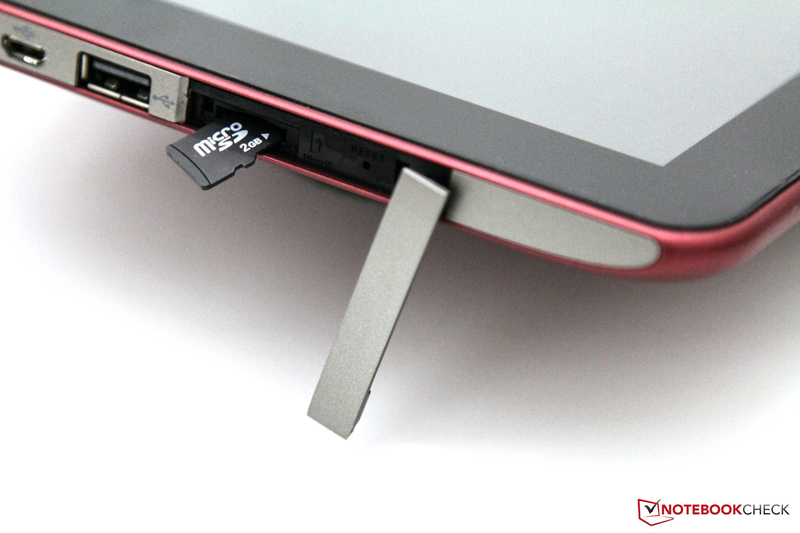 Acer hides the reset button as well as the card reader behind a small cover because these components aren't in permanent use. The interface positioning doesn't give reason for complaint. Merely the lack of a docking port and video out are points of criticism. 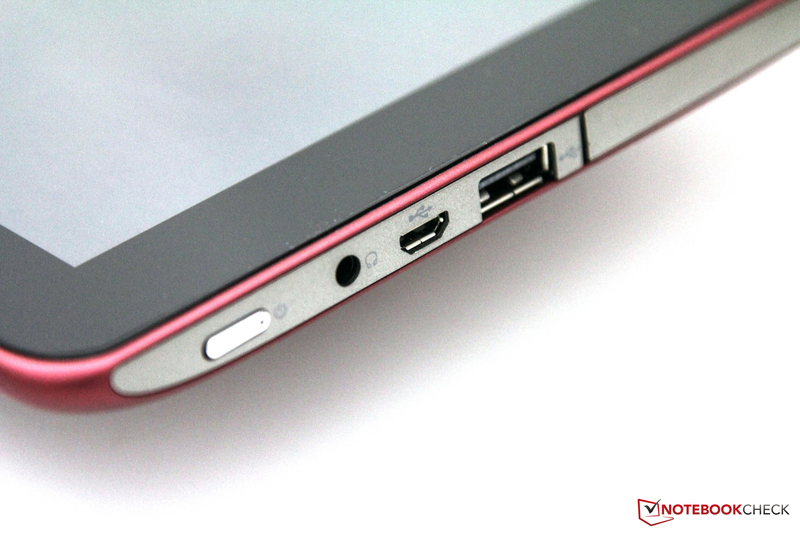 The more expensive Acer Iconia Tab A500 has these ports though. Nevertheless, we would have expected at least a micro HDMI port at a price of around EUR 350. Considering the low start price, Acer omits an expensive UMTS module which would enable retrieving and receiving data. Instead, the A200 features a cutting edge wifi module (802.11 b/g/n) for local wireless networks and the possibility of transmitting data via Bluetooth 2.1 +EDR. In terms of sensors, there is hardly anything left to be desired. The tablet has a gyroscope, acceleration and positioning sensor (GPS), which can be used for games or navigation in the car for example. The device adjusts the screen brightness according to the ambient light via the built-in brightness sensor, which can contribute to energy saving. 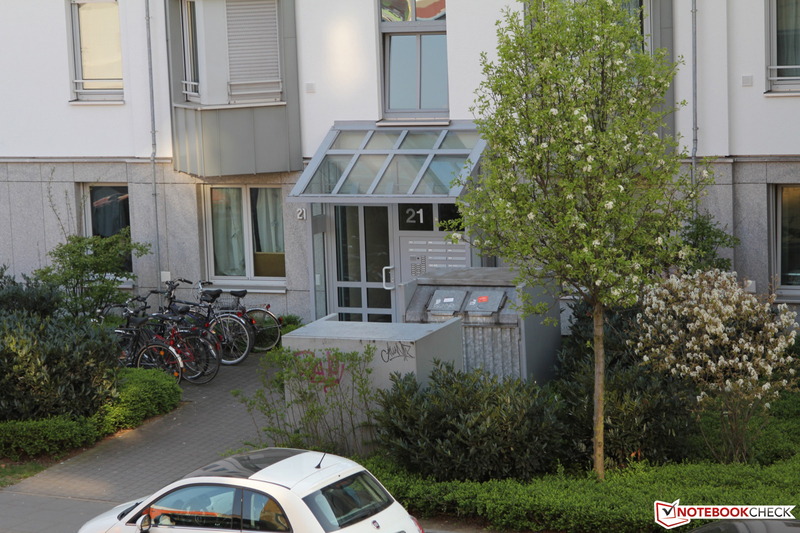 We have to note that the GPS module's functionality as a navigating system could be limited due to the lack of an Internet connection on the move, depending on the application. Maps would for example have to be saved locally beforehand. Acer doesn't build a high resolution rear camera into this tablet and only uses a 2 megapixel front camera that is conceived for quick snapshots in front of the tablet or for video telephony. The picture quality doesn't convince in the practical test and we can't let the combination of a low-end camera and omitted lens on the rear pass. Of course, the question remains how often you will use the tablet to take pictures. Your smartphone or an inexpensive digital camera will certainly make nicer pictures because they are more comfortable in use. Acer relies on the new Google Android 4.0.3 aka Ice Cream Sandwich for the Iconia Tab A200's operating system. However, no changes have been made to the appearance. Acer has implemented a nifty widget called Acer Ring and which can be opened via a small symbol in the lower bar. In addition to the volume, four predefined programs and important bookmarks can be opened quickly with it. A nice feature: Screenshots can be made with only two clicks. There are also various programs installed ex-factory; among others, the popular e-zine reader Zinio, McAfee VirusScan Mobile, SoundHound and Aupeo. These apps can naturally be removed via the Android market in case of dissatisfaction. The box only contains the most necessary supplies beside the tablet. 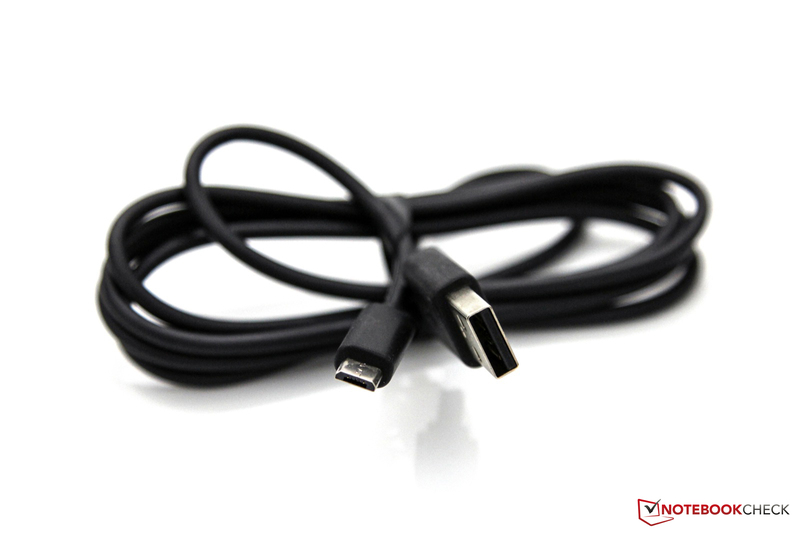 A micro USB-to-USB cable for data transfer between computer and tablet, a few manuals and an 18 watt power adapter with an EU adapter plug belong to this. The power adapter is fairly light with a weight of a bit over 100 grams, but the short cable (95 centimeters) quickly proves to be a problem. The optional accessories can't really help here, but the range is relatively vast. 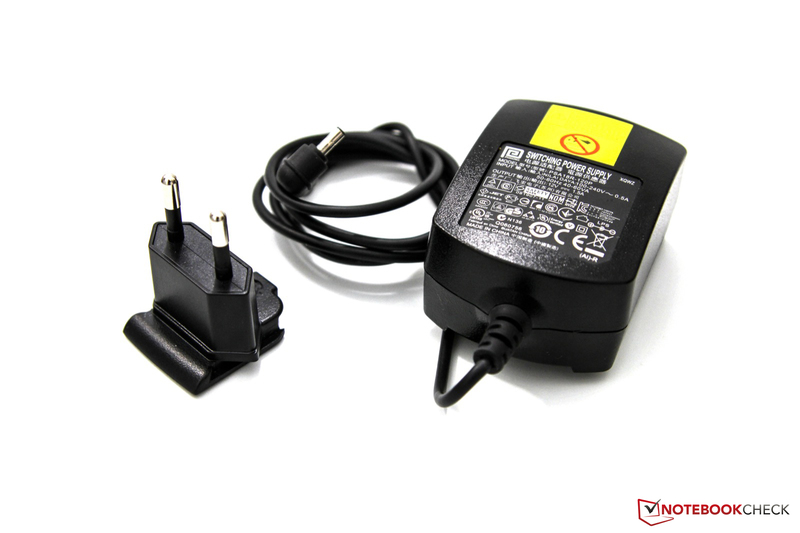 For example, a matt protection film for EUR 18 or a travel adapter set for the included power adapter (EUR 34). Looking at price comparison sites for these products is recommended since the prices partly vary greatly. Acer grants a warranty period of 12 months ex-factory which includes an International Travelers Warranty (ITW). 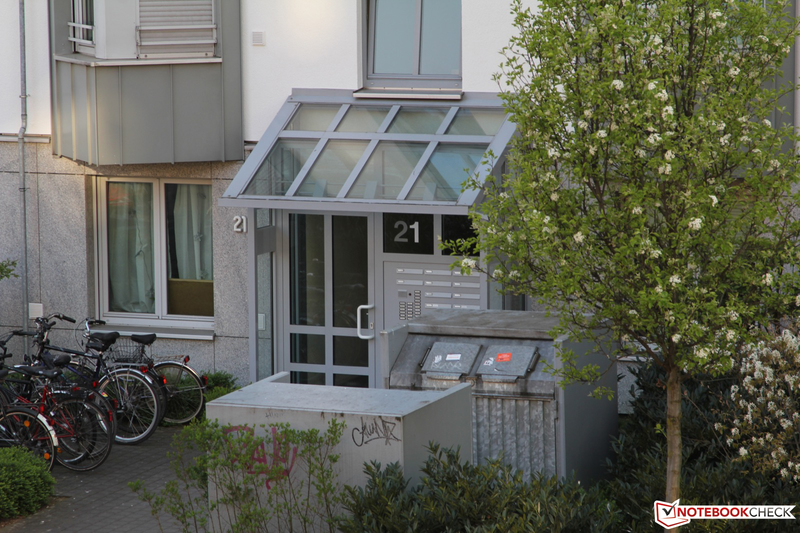 A warranty extension is available for a surcharge, which covers 36 months after purchase date and costs EUR 99 to EUR 139. 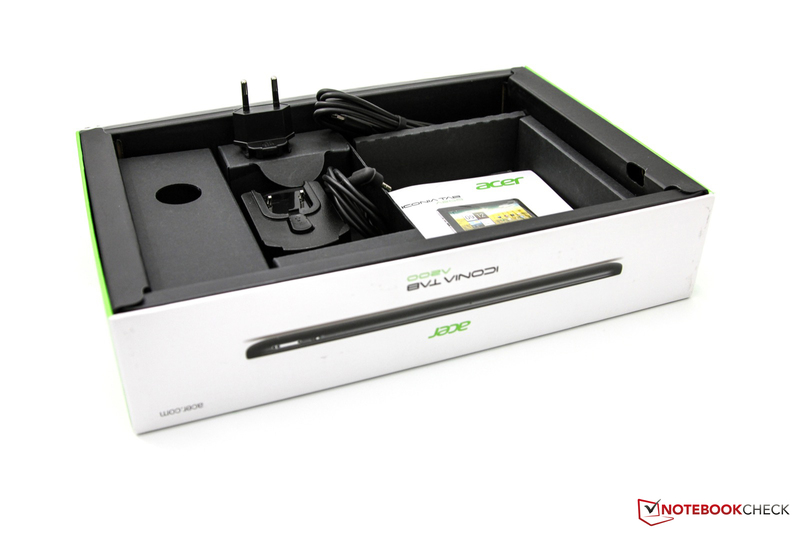 The price range varies due to the diverse additional services that are listed in the Acer Store. 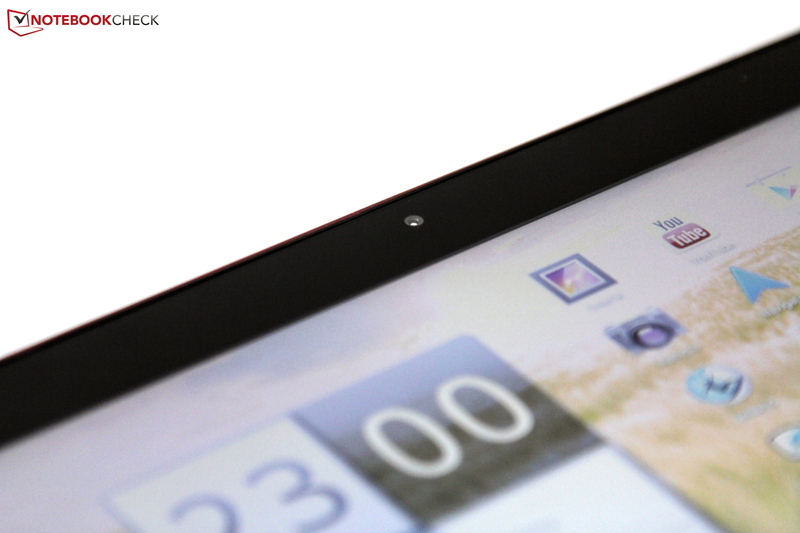 Inputting is limited to the capacitive touchscreen via your fingers on this tablet. Even longer texts can be typed comfortably on a virtual keyboard that is faded in automatically by Google Android when required. Acer didn't modify anything here and the input options are based on Google's specifications. However, various programs which are to facilitate the use even more can be found on the Android market. Other possibilities would be an external Bluetooth keyboard or a special stylus for drawing. But these gadgets have to be purchased separately. The screen basically responds precisely to strokes and touches of the fingers. Multi-finger use is also supported. This is very useful when looking at pictures or surfing on the Internet for example. 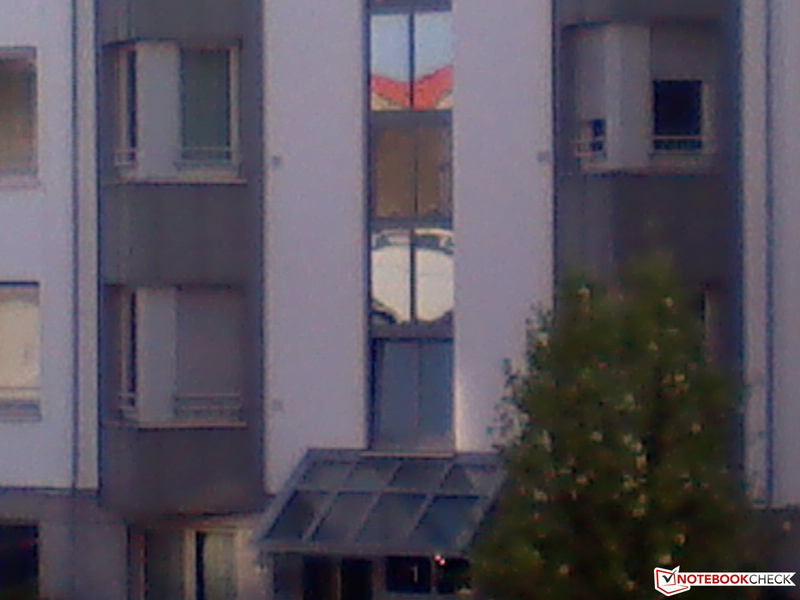 Here, it is possible to apply pinch-to-zoom (two-finger zoom) for zooming in or out of the corresponding area. The touchscreen detected up to ten fingers at the same time in the test. 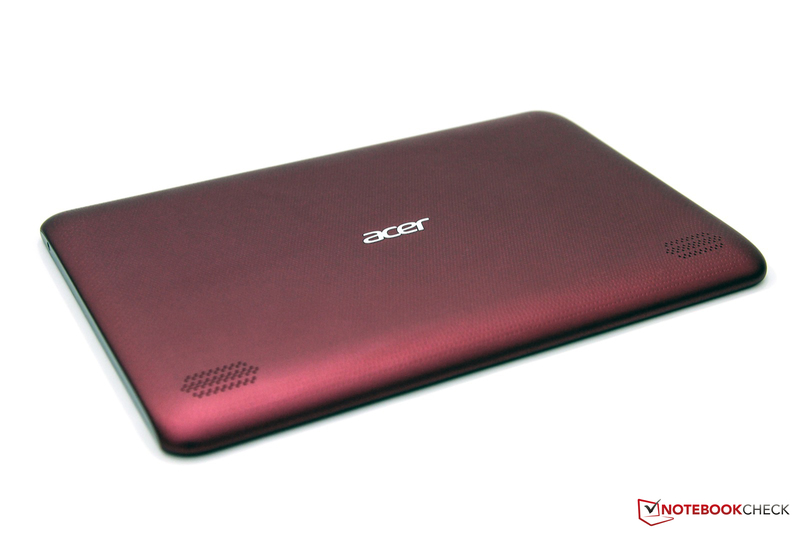 Acer uses a 10.1 inch screen with an LED backlight and glossy surface for the screen. It has a resolution of 1280 x 800 pixels (160 dpi) in a 16:10 aspect ratio. 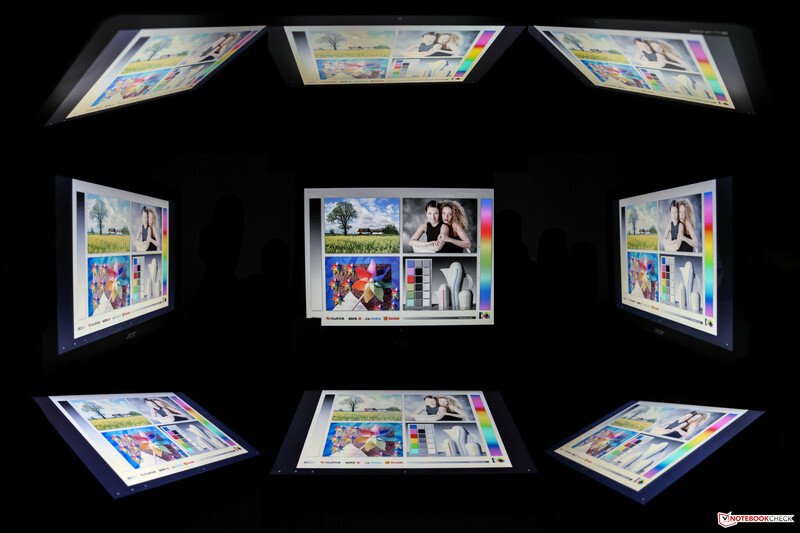 Looking at the Mobile World Congress 2012 (MWC), the trend clearly heads toward high-resolution screens (Full HD). Apple was the first manufacturer with a device whose screen enables a native resolution of 2048 x 1534 pixels (264 dpi) at a size of 9.7 inches. However, other manufacturers have also announced their high-res tablets. The biggest advantage of a higher resolution is the higher pixel density which presents fonts significantly clearer. Nevertheless, the subjective impression of the A200's screen is positive. The fonts appear crisp and the colors look bright. The measured rates only reflect this impression to an extent. The maximum brightness is around 208 cd/m2 on average and thus only in the entry-level range. High-end solutions easily surpass the 300 cd/m2 limit in this test (Apple's iPad). The leader in the field of screens is the Asus Eee Pad Transformer Prime TF201 with rates beyond 500 cd/m2. This extra brightness is especially noticed positively in outdoor use. The other measured rates confirm a principally good picture. The screen's illumination of 87% is good and the marginal fluctuations can't be seen with the naked eye. A saturated black is reproduced due to a low rate of 0.21 cd/m2 and the resulting contrast of 1076:1 is high. Most TN notebook screens can only dream of the last two rates. 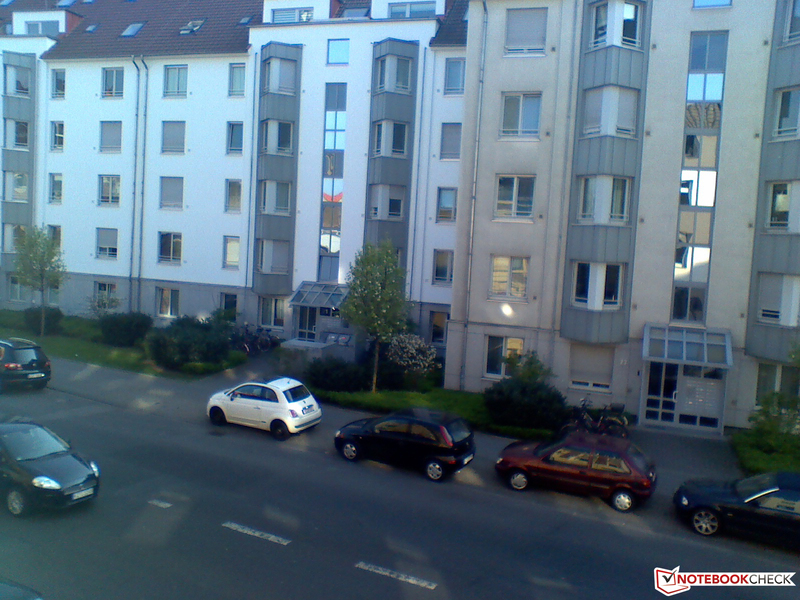 The screen's moderate brightness is noticed outdoors. 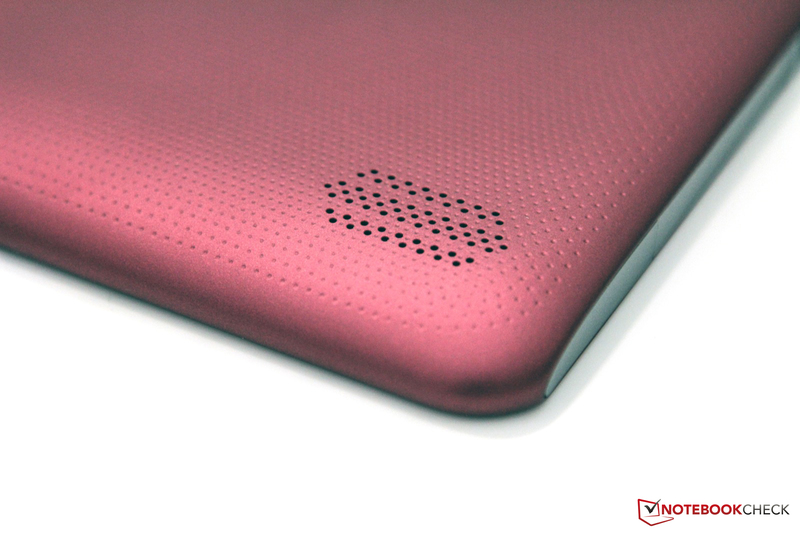 The interplay of brightness, glossy surface and sunlight quickly turn the tablet into an expensive accessory. The content can only be read with difficulty if at all. A matte foil remedies this only to an extent because the brightness is too weak on the whole. The device can't be recommended for frequent outdoor use. Another cost-cutting measure in the screen field results from the use of a conventional TN display rather than a high-quality IPS alternative. 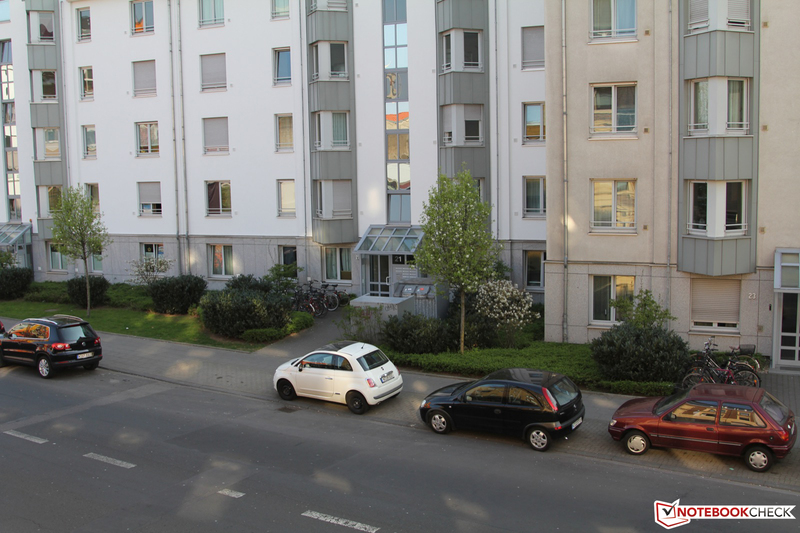 It would also supply a more stable picture even at wider viewing angles. However, it is astonishing that the viewing angle dependency of the TN screen used isn't as great as previously anticipated. Nevertheless, it is visibly present. Acer also opts for the Nvidia Tegra 250 platform for the core components. The CPU clocks with 2x 1 GHz (dual core). Together with the integrated Nvidia GeForce ULP graphics, this team has had to prove itself in many smartphones and tablets. However, the successor range Nvidia Tegra 3 is waiting in the wings. Compared with the base of our test device, this update now features four cores (quad core) at clock frequencies of 1.4 - 1.5 GHz. However, only the Asus Eee Pad Transformer Prime TF201 is available with the faster solution. Moreover, the Iconia Tab sports a 1 GB LPDDR working memory and an internal 16 GB flash memory. The latter can be extended by an additional 32 GB via the micro SD card reader (microSDHC). This adds up to a gross capacity of 48 GB. The performance in the various Android benchmarks is on a par with other Tegra 2 tablets. Booting and working with the A200 seem to be an ease subjectively. The available performance is sufficient for the normal user seeing that only several programs and a stress test bring the tablet to its limits, which lets the window setup take a bit longer. In view of the benchmarks, it can also be seen that the Tegra 3 tablet from Asus is clearly better. 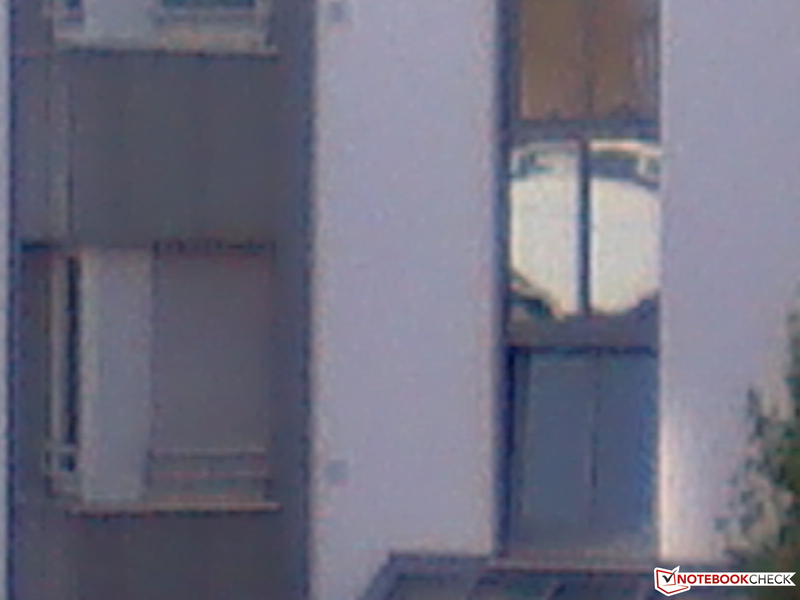 The analysis of the operating noise is unnecessary because of the fan-less design. There is also no hard disk that could be a potential source of noise since the Tegra 2 tablet uses a modern flash memory. The components' waste heat is passively emitted solely over the case. The measured temperatures on the case's outsides show that this solution has proven itself. The rates are overall inconspicuous no matter if idling or during load. The case is always cool and only heats up marginally after longer use (maximum temperature: 32 degrees Celsius). (+) The average temperature for the upper side under maximal load is 27.4 °C / 81 F, compared to the average of 30.7 °C / 87 F for the devices in the class Tablet. (+) The maximum temperature on the upper side is 29.8 °C / 86 F, compared to the average of 34.8 °C / 95 F, ranging from 22.2 to 51.8 °C for the class Tablet. Acer placed two stereo speakers on the rear for music or movie playback. They are inserted unobtrusively in the rubber coated surface. The speakers' sound doesn't knock our socks off. The high pitches are too prominent and they lack mids and low pitches as well as basses. Thus, this built-in solution is only suitable to an extent for media playback. Documentations or podcasts without music are a more suitable field of application for the speakers. High-end headphones that can be connected via the audio combo port are recommended for a good sound. The A200's power consumption is higher than other Tegra 2 tablets. The device remains inconspicuous with a maximum of 4 watts when idling. However, the maximum consumption increases significantly during load and achieves a peak of 14.9 watts. The Medion Lifetab P9516, based on identical hardware, consumes a maximum of 6.2 watts in the same measurement and thus 50% less. Since this measurement shows an inconsistency compared with the minimum possible battery runtime, we assume a measuring error, respectively an outlier to the top. A lithium polymer battery with a capacity of 3260 mAh faces the consumption. The runtime varies between nearly five hours during load with maximum screen brightness and enabled mobile technologies and over 15 hours with minimum brightness and disabled communication modules, depending on the application scenario. The Iconia Tab manages a good runtime of around 8 hours in the more realistic average (wifi surfing). A pleasant screen brightness (60%) is selected and the wifi adapter is enabled for this purpose. Internet surfing is simulated via an automated script in this assessment. The Acer tablet gives an overall good performance in this section. The Acer Iconia Tab A200 is positioned among budget tablets available for starting at EUR 349 (RRP) with known components and a slimmed down configuration. The plastic case makes a good quality impression, the application performance of Nvidia's Tegra 2 platform convinces and the battery life as well as the silent operation are further plus points that speak for the device. Another advantage for the user is the new Google Android 4.0 (ICS) operating system. This stands in contrast to the comparatively thick case, the total weight of over 700g and the mediocre stereo speakers. The fact that Acer hasn't treated the A200 to a high-end rear camera is a point that can be argued about endlessly. Unfortunately, the 2 megapixel front camera and its quality can't compensate for the lack of the rear camera. But it doesn't inevitably have to. We miss a video out ala micro HDMI and a docking port which would open further possibilities a lot more. Except for the moderate brightness, the acceptable rates of the used TN screen with a resolution of 1280 x 800 pixels convince. However, it of course can't keep up with higher quality IPS counterparts. All in all, it is an attractive tablet for your living room if you don't need the "latest and the greatest" and would prefer to save a few euros. 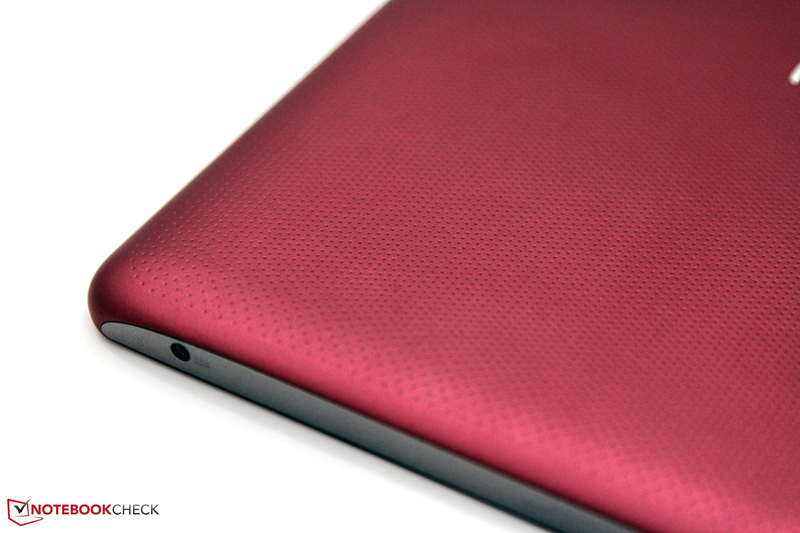 We tested the new Acer Iconia Tab A200 based on Android 4.0.3 ICS. The necessary supplies are found in the box. Sound recordings are possible via the built-in microphone. The stereo speakers aren't the greatest. Rotation lock and volume control on the upper edge. You have a lot of pictures, videos or music tracks? No problem. Peripherals can be connected via two USB ports. The 2MP front camera suffices for quick snapshots. The tablet is not particularly slim with a height of 12.7 mm. It is available in either red or gray, depending on preference. ... a USB cable for data transfer with the computer. The case's pleasant feel and the good application performance under Android 4.0.4 ICS in combination with the start price of EUR 349 (RRP). Above all, a slimmer case and a video out (micro HDMI). A reasonable TN display would be quite legitimate in a budget tablet. Various low priced tablets with a 10 inch screen: Viewsonic Viewpad 10s, Archos 101, Lenovo Ideapad K1, Asus Transformer TF101, Medion Lifetab. The reference: the new Apple iPad with a Retina screen.